On Monday, Norman North High School’s star point guard Trae Young received his McDonald’s All American Jersey. Young is coming off a 62-point outing against Edmond Memorial – an Oklahoma record for scoring in a single game, but almost normal for Young, who is averaging 43 point per game this season. Ranked one of the top point guards in the country, Young has drawn attention from schools including Kansas and the University of Kentucky. There are more local schools in the chase as well, with the University of Oklahoma and Oklahoma State making pushes for the young superstar. Though Young and his family have remained silent on the school he wants to attend, in a tweet posted on February 3rd Young said that on February 16th, Thursday, he would finally commit to a college. There’s no way to know what the star point guard is thinking. However, ESPN believes it to be narrowed down to the University of Oklahoma and the University of Kansas. Some schools make more sense than others. Oklahoma University makes sense for Young if he wishes to stay close to family. Surely this would make them happy, since OU is one of the top academic schools in the nation. Lon Kruger is a fantastic coach with some charisma; however the program can be lackluster. This year is a prime example. With Buddy Hield having left last year the team has gone 8-16 during the season and 2-10 in the Big 12. The next school making a push is Oklahoma State University, which has the same advantage of being local and an even better basketball program (both this year and in the past). But don’t think they’re having a good year. OSU is 16-9 overall and 5-7 in the Big 12, which is better than OU but not by much. With that being said, OSU may be the least likely destination for Young. Next are the big hitters; University of Kentucky and Kansas University. Both are great basketball schools with more basketball history than one could imagine. Both boast teams with 20 or more wins this season and a real shot at the NCAA Championship. Kentucky hasn’t gone after Young hard enough though, with little mention recently, leaving Kansas as the last big basketball school in the chase. 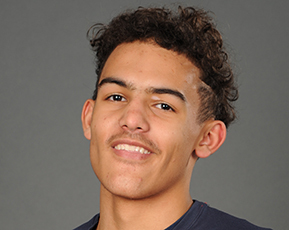 All things considered I believe we will see Trae Young don the Kansas basketball hat on Thursday.